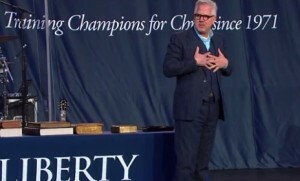 LYNCHBURG, Va. — Liberty University is defending its decision to invite Glenn Beck to take center stage to address thousands of students during its annual convocation ceremony, whose speech included references to Joseph Smith and Mormon theology. Beck was introduced by President Jerry Falwell, who noted that the university presented the political commentator with an honorary doctorate in 2010 as he likewise addressed the students during that time. Falwell remarked that the “Sounds of Liberty” also performed at Beck’s “Restoring Honor” event that year in Washington, which the university chancellor attended. Beck then took the podium to applause and cheers, explaining that he believed he was given a message from God that day to share with the students. He then compared Smith’s story to the challenges that Liberty students may face in the days ahead. Later in his message, the Mormon talk show host told the students that “no one in the Grand Councils” sent them to earth just to make a living. Beck was referring to the Mormon belief that human souls pre-existed in heaven, and that a gathering of heavenly beings known as the Grand Councils, send certain individuals to earth to accomplish a special purpose. “You didn’t come down for a job. You came to this university maybe thinking, ‘I have to have an education to get a job.’ You need this education from Liberty University because of your only true job, the purpose you were sent here for,” he said. Beck’s comments were met with cheers and applause during several points in his speech, and was given a standing ovation by many in attendance upon his conclusion. But some expressed dismay at the invitation, including ex-Mormons who said that those of other religions should not be given the platform, which creates an appearance of credibility. On Monday, Jonathan Merritt of Religion News Service published a response from Liberty University regarding Beck’s appearance, stating that the university often uses its convocation services to present those of diverse beliefs, which it believes can be beneficial for students’ faith. Moore also asserted that he had been informed that Beck recently had become born again. “As Jerry Falwell, Sr., our founder, often used to say about speakers at Liberty who had different views than him, Liberty students are smart enough to eat the fish and spit out the bones! I believe that’s as true today as it was in his day,” Moore concluded. Beck likewise went on the defense during his radio show on Tuesday, acknowledging that his faith is unlike that of Liberty University, while denouncing those who disagreed with his speech. Still, some remain concerned over the invitation, stating that the university seemed to embrace Beck rather than repudiate his Mormon teachings. According to reports, as with other convocations, students who skipped the event were fined $10 for their failure to attend the ceremony. Liberty University did not respond to requests for further clarification.